Born in 1887, Jewish-German architect, Erich Mendelsohn would have much to contend with in his lifetime. At the age of 21, he began his study of architecture in Berlin, later transferring to Munich where he graduated in 1912. His career was interrupted by WWI, after which he set up his first architectural practice in Berlin. Culture Trip brings you a historical and visual introduction to this architectural influencer. The Einstein Tower, Potsdam, was Mendelsohn’s first major work and continues to be his most renowned creation. 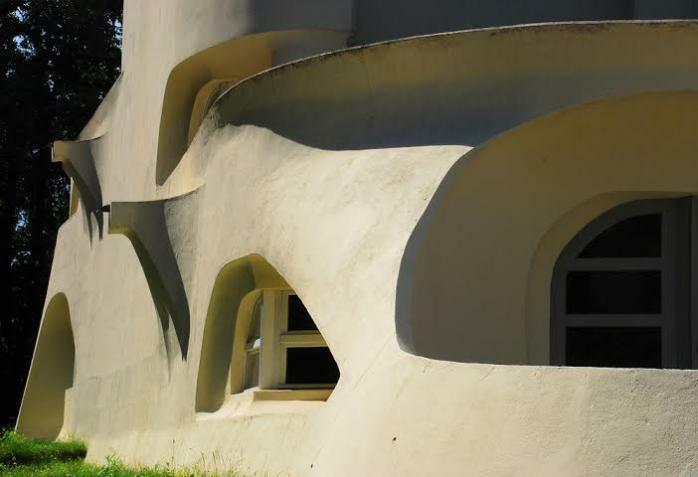 The stucco exterior allowed for smooth organic curves flowing around the building in ways never seen before. The reception was mixed, with some calling it an ‘ungainly spaceship’ – perhaps not necessarily a bad thing for an observatory. The unorthodox arches and exciting levels of the Einstein Tower enhanced his status as an innovator of architecture. Son of a hat maker, the Hat Factory in Luckenwalde was a fitting place to establish Mendelsohn’s early reputation. 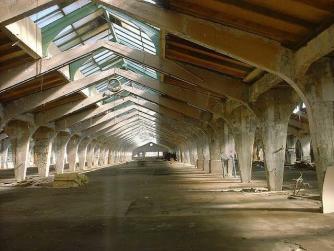 The vast dyeing hall was supported by great concrete rib cage, holding the busy heart of the factory together. Huge skylight panels ran the length of the hall, flooding the building with natural light for the workers. This was a functional space as well as a striking work of architecture. Mossehaus, originally a printing press and newspaper offices, is one of his most acclaimed works today. 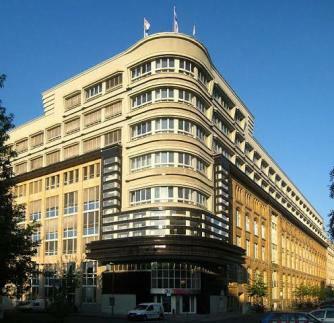 The long horizontal lines of the windows that wrap around the corner make this building an important work of Streamline Moderne – a late deco style of curves, lines and nautical influence. The use of grey and black interlocking tiers exemplied the style and had an impact on future Art Deco and Streamline Moderne works. At one time, this was the tallest building in Berlin, although since then, huge tower blocks have been built nearby. In 1933, with growing anti-semitism in Germany, Erich Mendelsohn emigrated to England. 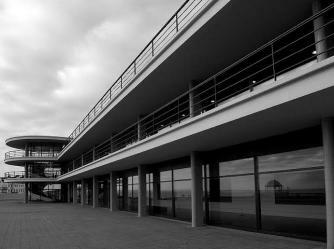 Here he met Serge Chermayeff and together they created the De La Warr Pavilion in East Sussex. Some claim this was the first major Modernist public building in the UK, with its sweeping helical staircase and curved balcony evoking ocean liners and the Art Deco. Unfortunately, this was a building built at the wrong time for holiday makers. During WWII, the building was taken over by the military and suffered some damage during air raids of the local area. Finally, in 2005, the building underwent extensive restoration and was reopened as a center of contemporary arts, becoming one of the largest galleries on the south coast. Shortly after the De La Warr Pavilion, Mendelsohn began work for Chaim Weizman, later President of Israel, designing a series of buildings in Palestine and Weizman’s own home. The Weizman Residence is today regarded as one of the gems of modernism in Israel. A building of flat planes and straight edges has been dramatically enhanced by a central staircase tower. Floor to ceiling windows run the entire length of the tower, filling the space with light and emphasizing the elegance of the architecture. The white walls of the building are offset by striking crimson surfaces under the cantilevered roof. Mendelsohn brought the International Style of Le Corbusier to the heart of the Middle East with this building. Now with an established office in Jerusalem, Mendelsohn has worked on many more commissions in the country, including numerous medical institutions and an Anglo-Palestine bank. 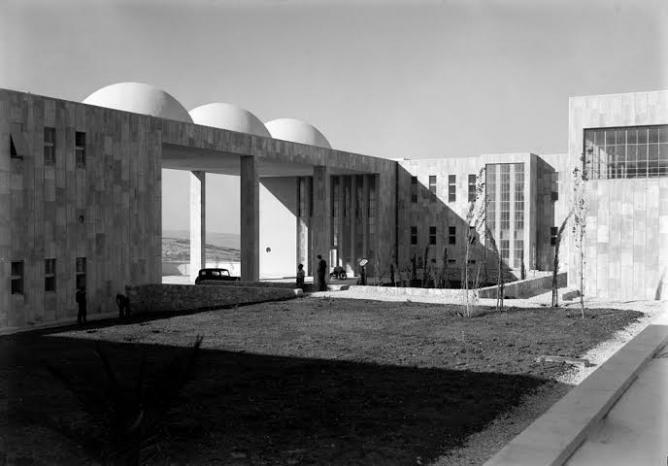 The Mount Scopus campus of Hadassah Medical Center looks more like a hotel than a hospital – Mendelsohn did not wish to create a traditional, purely functional medical building, he wanted the same sense of art that was in all his other works. Warm stone, a tranquil pond and a neat courtyard with domed veranda overlooking the city – this was not a place to be ill, but a place to get better. After his works in Jerusalem, Mendelsohn emigrated to the USA where he lived until his death in 1953. As the second world war progressed, Mendelsohn became an adviser to the government, assisting bombers with his knowledge of German housing estates. In 1945, he moved from California to San Francisco, where he undertook various projects, particularly for the Jewish community. 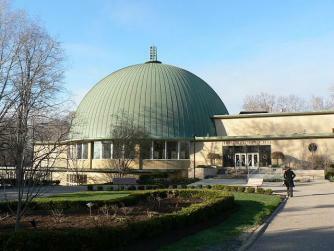 One of his last works, Park Synagogue (completed in 1950) is considered an important example of modern synagogue design. A great dome sits low on the building, creating an intimate space and uniting the congregation. Mendelsohn’s blending of International Style, Art Deco and the Streamline Moderne have influenced architects around the world, earning him a place among the elite of modernist architects. Tamsin Nicholson is currently studying Art History in Glasgow. With the Royal Naval Reserves, she sails to off-the-beaten track costal locations. Her keen interest in art and culture has taken her through Europe by train and across the Atlantic. Find her doing tours of Glasgow Cathedral.